One of our focuses over the last several months was to create more features for our agency and enterprise customers. That’s why we introduced sub-accounts, activity logs, and enterprise integrations such as Eloqua, GetResponse360, and more. Today, I’m excited to announce our newest feature: Custom Branding. Now you can setup your branded version of OptinMonster to create a more consistent user experience for your agency clients and employees. If you’re an agency or enterprise customer, then today you will see a new menu option appear under your Accounts screen called Branding. On this screen, you can customize the look and feel of your OptinMonster dashboard for your clients. You can upload your logo, customize the color scheme, and even enter your own custom CSS for complete control over the style of your pages. You can also customize the login and dashboard URL by using our subdomain at yourbrand.optinforms.com. When you enter your brand name, it replaces all instances of “OptinMonster” through out the app including all app emails. Custom branding is perfect for agencies who want to maintain control of their clients’ experience while offering all the advanced targeting features of OptinMonster. You can get to access custom branding, by signing up for our Agency plan or Enterprise plan. We’re working on redesigning the OptinMonster marketing website, so we can better highlight all the amazing features we’ve added over the course of this year. The redesign will also come with a new resources section that I know you will love. Our team is also working on a more unified OptinMonster in-app experience from the dashboard to the builder. This will include a brand-new drag & drop OptinMonster builder that you can use to create completely custom templates. I will be sharing the previews in the emails over the next few months. This is one of the most asked features, and trust me – it’s going to be amazing! I want to thank you for your continued support of OptinMonster. P.S. 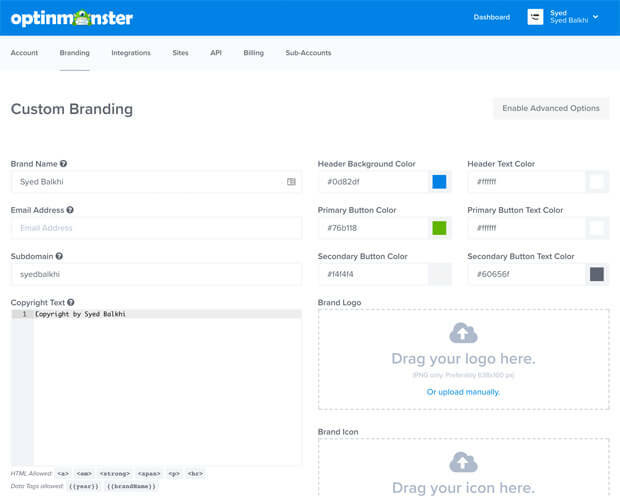 If you’re not already using OptinMonster, and you want try out OptinMonster’s new custom branding and other features, then try OptinMonster today, and you’ll see why our users consistently rate us as the most powerful conversion optimization software in the market.